It may be the single most controversial change to a piece of fiction in the history of time. Seriously, this one still gets people upset. 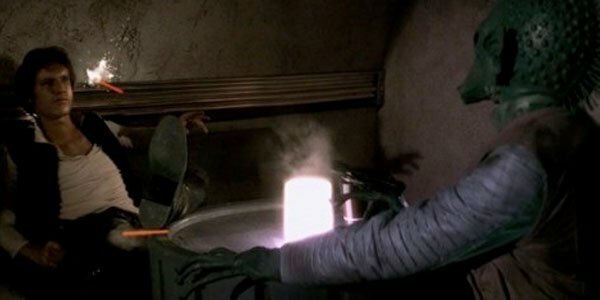 In 1996 George Lucas added blaster fire to the cantina scene of the original Star Wars: A New Hope with Han Solo and Greedo... and the world went crazy. George Lucas has said before that Greedo always shot first, but that it simply wasn’t clear. One guy from the set says that’s not true, and Han Solo fired the only shot. And this guy would know, as he’s the one who got hit. Paul Blake was the actor who played Greedo. The bounty hunter tracks his prey to the Mos Eisley cantina where he confronts the smuggler before planning to turn him in to Jabba the Hutt. In the original version of the sequence we see Han Solo blast Greedo from under the table. In the Special Edition version of the film released in the mid-90’s this only happens after Greedo has fired a shot and somehow missed at point blank range. Blake tells the New York Daily News that the original script says nothing about him firing. It said it all in the original script, we played the scene in English and at the end of the scene, it reads, 'Han shoots the alien.' It's all it says and that's what happened. It would be lovely to see them go back to the original version, I much preferred it, I must say. And it does give Greedo a little more glory if he's just blown away. This isn’t really a debate anymore is it? If anything this is confirmation of something that we already knew. Peter Mayhew posted images of the original Star Wars script on his Twitter account which says pretty much exactly what Paul Blake is saying here. While George Lucas has made statements that Greedo always shot first, he’s also made statements that he eventually felt that Han Solo wasn’t the sort of character that would shoot somebody like that, which certainly implies an intentional change. There’s little surprise Paul Blake would want to go back to the first version. His character looks completely useless in the new version. What professional bounty hunter misses somebody from across a bar table like that? Stormtroopers have better aim than that, and they don’t hit squat for the entire trilogy. In the original version, Han completely blindsides Greedo. This is probably because Greedo is such a badass bounty hunter that it was the only way Solo stood a chance. At least, we’re guessing that’s how Blake sees it. There have been a number of rumors in recent years that an unaltered trilogy may be released on Blu-Ray one day. It’s still early on May the Fourth. Maybe we’ll hear something today? We can dream.